3 Miles to a Mind-Boggling Marriage! Getting married is a little like buying a new car. If you’re smart, you’ve shopped around and done your research. Then comes the anticipated day when you finally cross your T’s, dot your I’s, sign your life away, and receive those shiny keys. You can’t wait to give it a test run and you could care less where the road leads. You’re just happy to finally have your very own new car. You know of other friends who have bought ‘lemons’ and had major disappointments down the road with their new vehicles, but of course that won’t happen to you! Not in THIS beautiful car! Such is the mindset of so many newlyweds. Yet, just as any car will eventually break down, every marriage experiences bumpy roads and unexpected twists and turns. The question is not necessarily how long will your marriage work, but how much WORK are you willing to put into your marriage? Without regular oil changes, maintenance, and repairs, any vehicle will eventually break down to the point of being stranded and un-driveable. Then the question is whether to just abandon the vehicle and replace it or put in the time and money to fix it. May I suggest how to not only get 3 miles but a CRAZY amount of mileage out of your marriage! 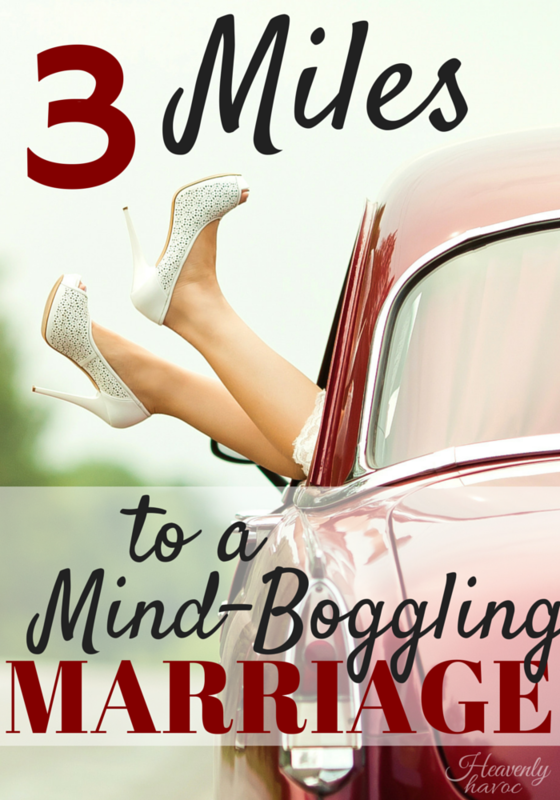 You don’t want mundane, you want a mind-boggling marriage! Mile #1. Make Room for a THIRD WHEEL! From a young age I learned from my mother the importance of putting God first in a marriage. For the longest time I wondered why my mom would always sign love notes to my dad with a ‘3’ by her name. When I was older she told me it was to constantly remind each other that their marriage was a partnership with God. The first time I gave my husband a card, I followed in my mothers footsteps. Invite God to be a part of your marriage, and he will make more of your journey than you ever could without him! Mile #2. Kick the “Backseat Driver” to the curb! It’s easy to see the faults in your spouse when that’s all you’re looking for. I’ve learned that the best the best way to improve my spouse is to improve myself! BE the person you want in a marriage, and most often, your spouse will follow your lead. If you want your husband to help out more, take an active part in his life and serve him. If you want your wife to be more intimate, spend more time listening and show her how much you care! Mile #3. Never Look in the Rear View Mirror! Constantly bringing up past mistakes and faults from the past will only poison your marriage and destroy trust. Why would your spouse want to ever sit down and have a heart-to-heart if they know you are going to bring up everything they did wrong in the past? My sister-in-law wrote a post and described this scenario perfectly and she likened it to a Diaper Genie. It’s hilarious and if you have the time I highly recommend you read it here. Focus on the road ahead and move forward! I’ve used this car analogy because I absolutely hate it when my car breaks down. I hate paying to get it fixed and I hate getting stranded. Recently, we had a flat tire while driving on the freeway. Thank Goodness for ‘dummy lights’ that day because I received enough warning to move over to the side of the road before what could have been a horrible accident. It was Sunday (we were on our way to a friend’s church 2 hours away) and my poor husband had to change the tire in his white shirt and tie. He was exhausted after cranking the chain down to get the spare tire and then having stubborn bolts that didn’t want to come off of the tire. He was about to give up when a blessed highway patrolman showed up to help with tools that we didn’t have. We were then able to make it to the tire store for a new tire and were on our way with only a few black streaks on our clothes to show for it. Sometimes we get ‘dummy lights’ in our marriages. We can either ignore them and hope they go away or we can heed them and fix the problem. Sometimes the trials we go through are exhausting and we just feel like giving up. This is where the triangle comes in and we learn to trust in God. He can heal marriages and help mend hearts, but only if we are willing to give up control of the wheel. Even if only one spouse is willing to change, that one spouse can make a difference! If you feel like you have nothing left to give, pray to you Father in Heaven and ask him to help you love your spouse. I have been so angry at my husband at times, I felt like I couldn’t possibly muster up any love. I know that God loves him, though, and during those times I turn to him for help. Miracles do happen. Old, beat up cars can be restored and become new and beautiful again. Give your marriage all that it deserves and then leave the rest to the Lord. If you think getting the most miles out of your car is important, try putting as much effort into your marriage. You might just find you actually have a mind-boggling marriage that will get you anywhere you want to go in life! *Disclaimer: I am not a medical professional or marriage counselor! Just an average person sharing my experiences in life. Not every marriage is the same. My heart goes out to those who may be experiencing abuse of any kind from a spouse. Every situation is different. Trust in God and follow where he leads you.